On normal college days, I stop the alarm and go back to sleep. But whenever there is a trek organised by the P.H.C., I must be the earliest bird to rise. This year's third trek was a one day hike to SAGARGAD and the reporting time had been fixed at 5:30 am on a fine Sunday morning. After equipping myself with all things that a hiker must, I left for college. For the first time, I got to a chance to experience the lonely street with dogs barking and no sign of humans anywhere. I managed to reach the college by train at about 5:45 am thinking that I would be the only person late, but many were still to come. After a long wait for checking attendance, etc., we started our journey at 6:35 am by a mini-bus as there were fewer students attending the hike. But the first event occurred when a student phoned us, when we had already crossed the VASHI toll naka. We waited for him on his request and he joined us. From there we started once again towards ALIBAG. As usual, the journey was filled with songs, laughter, joy, excitement, games and a little of leg-pulling also. After a brief halt for tea, snacks etc., we moved on and finally reached the base village of SAGARGAD. It was going to be my 6th hike with the club. The sun played hide'n'seek. The climate did not have any rain for us, but the land was moist and we were told that there was a superb waterfall, where we would be cooling ourselves on our way back down. Our group was small and a few lines of instructions to the hikers by PROF. PHADKE marked the start of our trek. We walked a kilometer or two on flat land until we reached a small stream and from here started the actual climb. It was supposed to be a pilgrimage spot having a temple of LORD SHIVA at the top where we had planned to take our lunch. But before that we were supposed to reach SAGARGAD which is a fort with minimal construction. 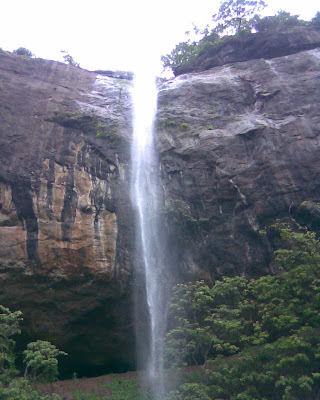 We had one halt on our way where we watched the dazzling waterfall which could be seen from the very start of our hike. At the top there was no highest peak as such, because the whole surface was like a plateau. We enjoyed ourselves near a well which was situated next to a stream having a slippery rock bed, where I was the first 'GOAL' scorer. Soon afterwards the glass of my spectacles came off and I was left with limited vision. But in the company of friends and nature, everything seemed normal. Unfortunately we followed the wrong trail and were not lucky enough to reach the exact location of SAGARGAD fort. Soon we came back to the temple which we had already passed before. After resting our tired feet, we removed our shoes and entered the temple where we ate food heartily. The temple provided safety from monkeys! After sharing lunch together, we all descended towards the WATERFALL. “ALAS! WOW! This is heaven! Yeah wonderful! Great, so beautiful naa! “-- all such voices were heard but got lost somewhere in the melody of the waterfall. It was worth experiencing the water falling in a 'spraying' manner from 100 ft. It was mighty! Like every previous hike, I clicked photographs on this one too. Finally we prepared ourselves to say goodbye to the place and walked towards the bus, where we changed into dry clothes and waited for all to arrive and then left for MUMBAI. On the way back, we halted for food. Later due to unexpected traffic jam, we reached a little late, maybe past 10:20 pm. I would opine that it was an easy trek -- ideal for first timers. It was surely a trek to be remembered. It pulls man closer to nature. Three cheers for PODAR HIKERS' CLUB which gives students an opportunity to experience the life beyond the busy college life. I would like to see you all for the forthcoming treks!! !